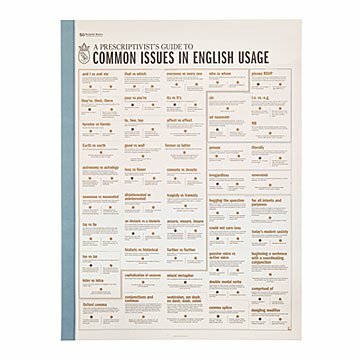 If bad English leaves you in tears, this print may be the antidote to your suffering. Irregardless of its importance, we could care less about the Oxford comma. Just kidding! That sentence makes us squirm, too. If bad English leaves you in tears, this print may be the antidote to your suffering. It explains what's wrong with our most common lingual mix-ups using fun examples that reference the likes of Kurt Cobain and Nic Cage. Not a grammar expert? It's also a great gift: for English teachers, lit lovers, and backseat proofreaders. (We all know one.) Printed by Ben Gibson and Patrick Mulligan in Brooklyn, New York. Was disappointed that the "hanging system" shown in the picture was not included.